If somewhat reluctantly, we turned our backs on the lovely Capitola with its perfect waves and holiday atmosphere, to head inland towards the first of the National Parks we planned to visit. Again the GPS proved invaluable – we were led by the dulcid tones of the GPS lady from Capitola straight to the REI (outdoor store) on the outskirts of Fresno! Fresno got the dubious title of the worst city to live in in 1983. Apparently the Lord Mayor at the time attempted to defend his city on the David Letterman show, by saying the temperature rarely got above 120 F and that shiny tracksuits were banned…..mmm. After dropping a few dollars on equipment for our forthcoming “wilderness” experiences, we left Fresno behind for the hills of Kings Canyon and Sequoia National Parks. The sun had set, and this raised our concerns slightly in relation to the bear population of the Park. Bears are a genuine concern when visiting any National Park in western America, West Canada and Alaska. And here we were, heading into our first national park, after dark, and not having a clue how to defend ourselves! Now, before you get all worried, bears are not aggressive towards humans (unless provoked or surprised), but what they really want is our food. They have an incredible sense of smell. They need to eat 10,000 calories per day, so your weekend supplies will fulfill this much more easily than scouring the forest for berries and grubs. Bears can open cars like tins of tuna, and will destroy a tent if you so much as have some toothpaste in it! 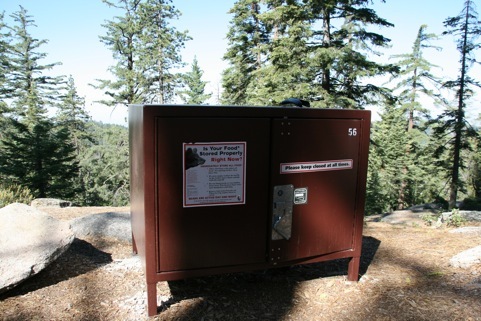 So, as we discovered, all campsites come equipped with “bear boxes”, which are essentially sturdy metal cupboards at your site, into which you must put all food, and anything else that has a scent. This includes all toiletries, scented candles, everything! 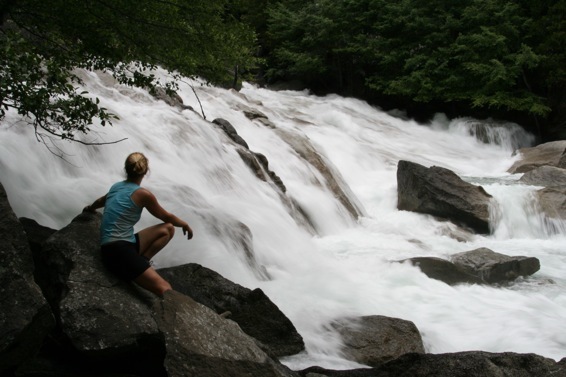 Going into the backcountry is another matter. As there are no bear boxes on site, you have to lock all your food & toiletries into a bear canister. When camping, you must put this canister at least 100 feet from your tent at night. The bear will be able to smell the food inside, but realises quickly that he can’t get inside it, and will leave it behind. So, back to our late (and dark) arrival at the Kings Canyon! We got into the park, discovered that bear boxes were readily available, and quickly settled into a few fireside beers with our neighbours. I think it was the relief at being bear-proof for our first night in bear country! We spent 4 nights in the lovely Sunset Camp beside the visitor village of Grant Grove. We found a lovely site overlooking a bluff, with pine forest and hills beyond. And, as the name suggested, a fantastic sunset each night. The location made it easy to visit both parts of the park. 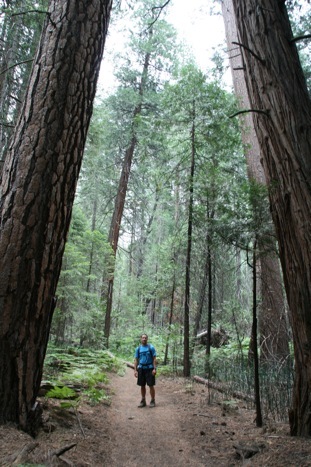 Sequoia Park, to the south, houses Giant Sequoia tree forests. 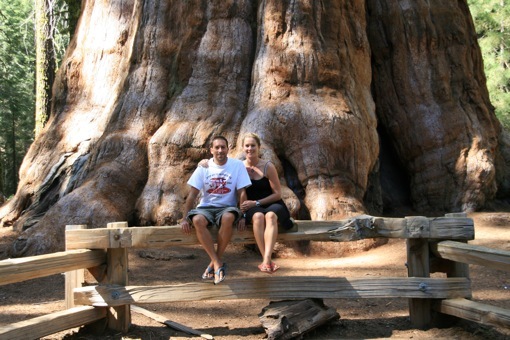 The largest tree in the world, General Sherman, is located here. It is 2,200 years old and is well looked after and much visited. 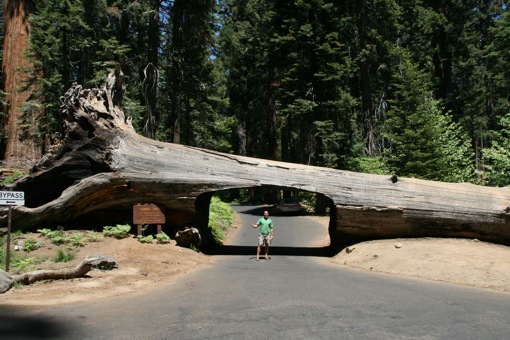 You can also drive through a tree here, and visit the original “christmas tree”. 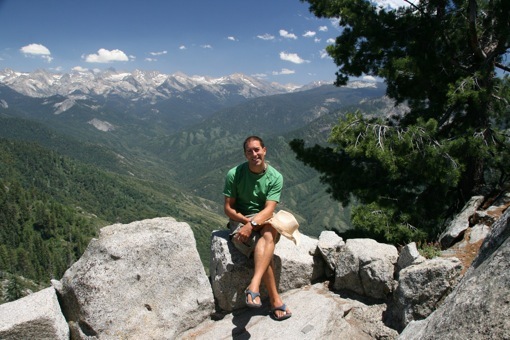 In Kings Canyon to the north, we enjoyed a drive up to Roads End, and a hike to Mist Falls. 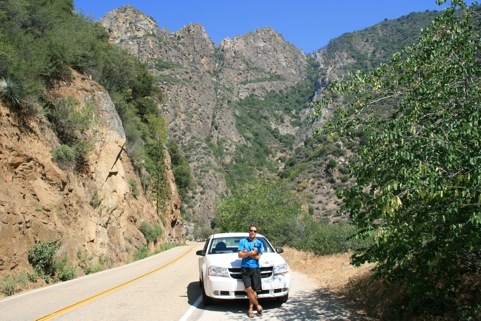 The canyon was impressive, but we felt nothing compared to what we were to see up the road at Yosemite. The weather was perfect here, clear blue skies by day, and temperatures at night that made it comfortable to sleep. 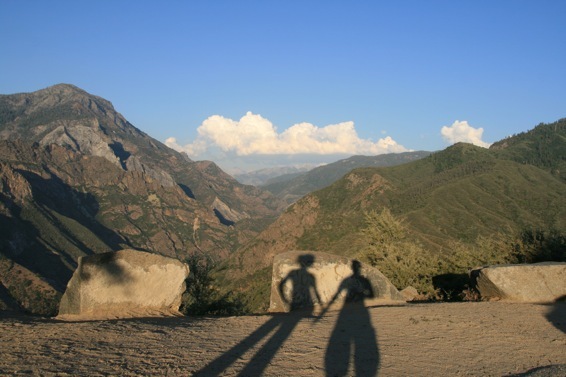 Viewpoint at Kings Canyon – recognise the shadows? Car looks a little small! just catching up on your web site – looks very impressive!! Great to chat to you last weekend – our trip to Dublin flew by but was great fun. Mum’s in good form and quite chilled – Jim too!! Wedding went vv well – rained til the evening but luckily it didn’t matter at all. She and I looked amazing!! 😉 so did Naoish!! Some great pics. 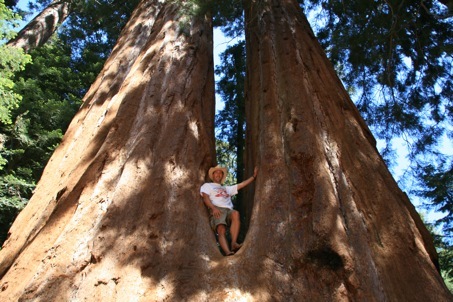 Can’t believe the size of the tree. Never seen one that big. Have to agree about the hat.